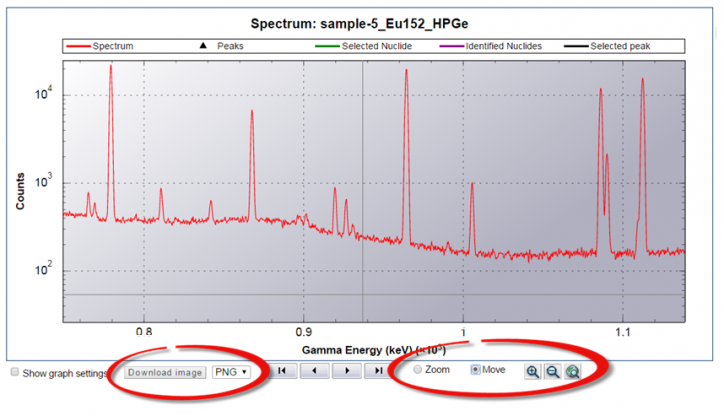 A number of new features have recently been added to the Nucleonica graphs. It is now possible to download the images in various standard formats, zoom into an area of interest and move the area of interest by dragging the mouse cursor. Typical Nucleonica graph showing the graph download/format buttons and the zoom / move radio buttons. * graph formats: the graphs – previously only available in svg format – can now be downloaded in a number of alternative standard formats including: png (default), gif, tiff, jpg, svg, pdf, eps, xml. * Zoom feature: The cross-hair can also be used to zoom into a particular part of the graph by defining a rectangular area to be expanded. The + and – buttons can then be used to further zoom in or out of the selected area. * Move feature: allows the use to move the underlying graph to view parts of the graph not shown in the selected area. This is particularly interesting when analysing spectra. After zooming into a particular area, the users can then use the mouse button to “move” the graph in the viewing area. This is done by placing the mouse cursor at an point in the graph and holding the left mouse button depressed. Then the depressed mouse button can be move in any direction to move the underlying graphic. On releasing the mouse cursor the graph is shown with the newly selected area.